This second-generation kitchen tablet made us forget all about Key Ingredient’s terrible first effort. I keep an old iPad in my kitchen to look up recipes online. It works pretty well as long as I remember to disable Auto Lock in the settings in order to keep the screen from going dark—the default setting shuts it down after a couple of minutes to prolong battery life. The reverse is true of the Key Ingredient Recipe Reader HD+. By default this 10-inch Android-Amazon-based tablet will stay on for hours so that you don’t risk losing sight of a recipe at a crucial moment. The tablet itself is top-shelf, with a crisp, bright 2043x1536-pixel display; an 8-megapixel front and a 13-megapixel rear-facing camera (for high-def food snaps); an 8-core, 2.1GHz processor; 2GB of RAM; 16GB of internal flash storage; an SD Card slot; and an FM radio. Wi-Fi and Bluetooth support are also included. It’s miles beyond the Key Ingredient’s earlier Recipe Tablet. You also get a kitchen timer app that lets you set times for several dishes (with the iPad’s clock feature, I can only set a single timer) and a weight and volume conversion app (which is handy if you want to use recipes from websites that use the metric system, but then why not add Centigrade/Fahrenheit conversion too?). You can download additional apps from Amazon’s app store. Key Ingredient's website hosts thousands of additional recipes that you can download to the tablet. Visit the Key Ingredient website and you can add recipes via a nifty Cookmark feature, a button that you can drag and drop to your bookmarks and activate by clicking when the browser is showing a recipe you like. This creates a cookbook entry that you can edit and save. You don’t have to pay for this feature, and the saved recipe will show up on the tablet app. The Key Ingredient tablet certainly offers attractive value adds—my personal faves are the multi-dish timer and the bundled stand—and the hardware is first-rate. But I’m disappointed that Key Ingredient hasn’t figured out a way to import the digitized recipes I’ve already collected over the years in other apps and in text files. 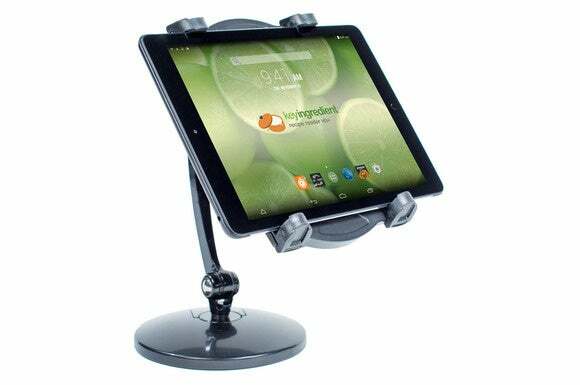 Cuisine enthusiasts who don’t already have access to a spare tablet for kitchen use should take a look at the Key Ingredient Receipe Reader HD+. 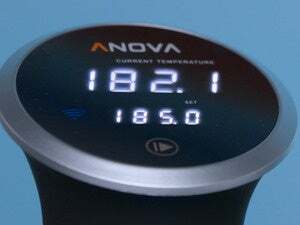 I think it’s a useful tool and would make a great gift for a tech-savvy chef—especially while it’s discounted to $199. Making a buy recommendation at its regular $399 price point would be a lot tougher. 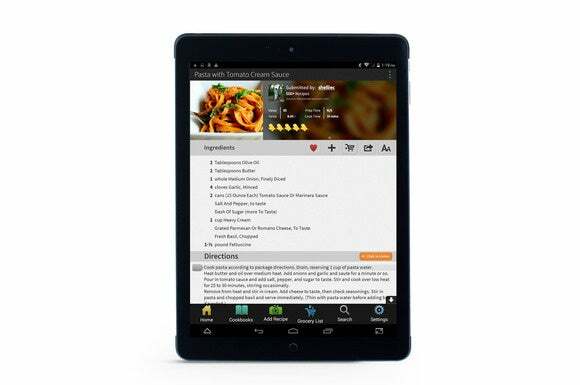 The Key Ingredient Recipe Reader HD+ delivers recipe management and other useful apps for chefs in a high-end tablet that comes with a good stand, but it’s expensive (when not on sale) and short on recipe-import capabilities.